New evidence of ancient volcanic eruptions in the North Pacific, uncovered by researchers, suggests that the risk of more ash clouds, such as the Icelandic volcano which brought air traffic to a halt in 2010, at an estimated cost of $5 billion, is greater than had previously been thought. The research team, led by Swansea University researchers, studied ice cores from Greenland, which act as a record of volcanic activity over the last 128,000 years. Recent technical advances allow small individual glass shards extracted from ice-core material to be analysed for their trace element signatures, a kind of fingerprint revealing their origin. The team found new evidence of explosive eruptions in the Pacific Arc during the later part of the Pleistocene era (between 2.6 million and 11,700 years ago), which are currently undocumented in the geological record. These eruptions dispersed volcanic ash up to 8000 km from their source. 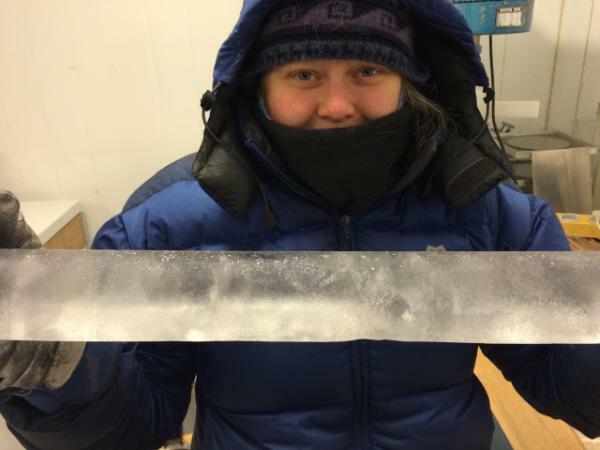 Picture: lead author Dr Anna Bourne holds a section of ice core drilled in Greenland. Ice-cores preserve a very detailed record of volcanic eruptions that have occurred in the past. The evidence was in the form of twelve microscopic ash deposits (cryptotephra) which are invisible to the naked eye. These deposits were found amidst masses of deposits from local Icelandic eruptions. They were generated in a subduction tectonic setting typical of North Pacific volcanic sources - which is very different from the kind of volcanism from the nearby Icelandic sources. The composition of the deposits matches them to northern Pacific Arc sources including Japan, Kamchatka (Russian Far East), the northwest coast of the US/Canada, and Alaska. Picture: North Greenland Eemian Ice Drilling (NEEM) site in NW Greenland where one of the ice-cores used in this study was retrieved. Led by the University of Copenhagen and involving 14 nations, the team drilled more than 2.5 km to bedrock in just over two years. They give a fuller picture of volcanic activity in eras before our own – the Holocene – which will lead to better assessment of the risk of ash clouds in the future. The research was undertaken at Swansea University as part of a European Research Council project led by Professor Siwan Davies. The eight-strong research team included five experts from Swansea University, with colleagues from Aberystwyth University, University of Copenhagen, and the Russian Institute of Volcanology and Seismology. "This new evidence gives us a fuller picture of the volcanic record. Some volcanoes are very poorly studied, and our knowledge is much less complete the further back we go." "It is clear from our research that many more eruptions in the past have deposited ash over much larger geographical areas than previously anticipated. This shows us that the risk of future ash clouds is greater than we had previously thought. Ash clouds can cause huge disruption, as we saw with the Icelandic volcano in 2010. It’s very important therefore that we have the best possible understanding of the risks. This means we need as full a picture as possible of volcanic activity in the past, which our research will help to provide." This work is funded by the European Research Council (TRACE project:Tephra Constraints on Rapid Climate Events) under the European Union’s Seventh Framework Programme (FP7/2007-2013)/ERC grant agreement no. . 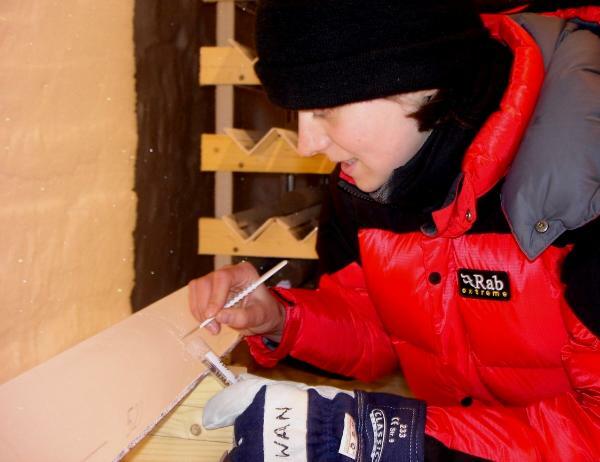 The Greenland ice-cores used in this study include the GRIP, NGRIP and NEEM records. 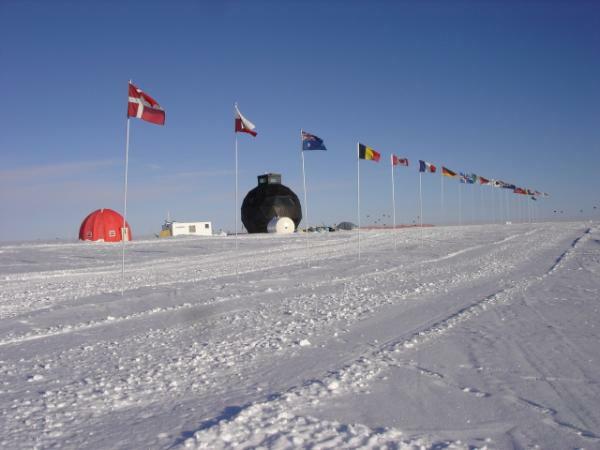 These records were retrieved as part of international ice-core research projects led by the Centre for Ice and Climate, University of Copenhagen, Denmark.